Alpine PKG RSE3HDMI - 10.1" overhead video monitor with a built-in DVD player 10.1" Wide Screen / Roof screen DVD/DIVX Player USB Output + 2 XHead phones.2 x HDMI Input, HDMI (Mirroring) USB Includes Remote Control. Dual direct HDMI inputs allow for video content to be played from any HDMI-enabled device, such as a smartphone with an HDMI adapter. The system is equipped with one AUX input to connect to external sources such as an iPod®, iPhone®, iPad® or game console (requires third-party cable, sold separately). Plug in a USB device to play videos with the most common format such as AVI, MPEG, MP4, MOV, FLV, RMVB, MP3, WMA, AAC, and JPEG. Alpine's PKG-RSE3HDMI rear seat entertainment system is the solve-everything hub for long car rides. 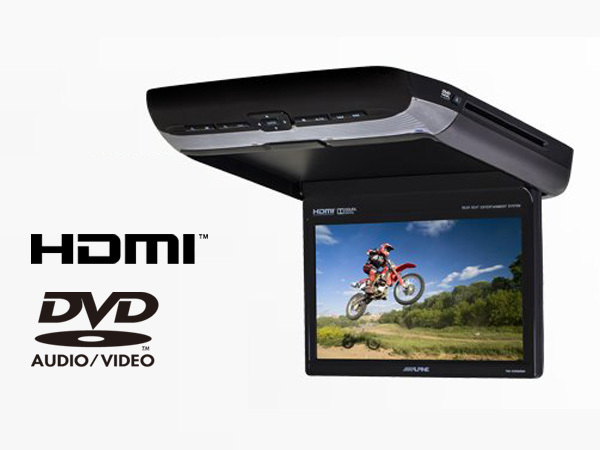 This overhead monitor/DVD player combo gives you plenty of media options besides DVD playback. Using the dual HDMI inputs, you can play HD video from any HDMI-enabled device like a smartphone or tablet. Alpine also includes two USB inputs (one for media playback and one for charging) and one composite video input to keep your options open. Now, everyone in the back seat will have a prime seat to enjoy movies, TV, and web content on the PKG-RSE3HDMI's crisp 10.1" flip-down monitor, thanks to stunning picture clarity and high brightness for better daylight viewing. Create the feeling of surround sound by tuning audio from the PKG-RSE3HDMI through your car speakers with the built-in FM modulator, or connect it to your stereo's auxiliary input. If the sound of Decepticon laser blasts or clanging swords is too distracting to the driver, back-seaters can listen privately via two included wireless headphones. You can give the kids full independence with Alpine's full-function wireless remote, or if you'd like a little more parental control, keep the remote handy to get their attention if you need to.